Border terriers love to learn. Known as highly intelligent, mischievous little imps, border terriers love a good challenge. By teaching your terrier to stand on command, you not only provide mental stimulation. but you'll also help your feisty, wire-haired friend learn to stand still for grooming and physical exams. Place your border terrier on a table. Because borders are only 11 to 14 inches tall, placing them on a taller surface keeps you from straining your back and legs. If you don't have a table you can use while teaching new commands, sit on the floor with your little guy. Hold a treat in your hand and put it directly in front of your terrier's nose. Keeping your hand parallel to the ground, move it slowly away from your dog. As your pup follows the treat with his nose, he'll stand up to reach for it. The second your dog is standing, reward him with the treat and praise him gently. 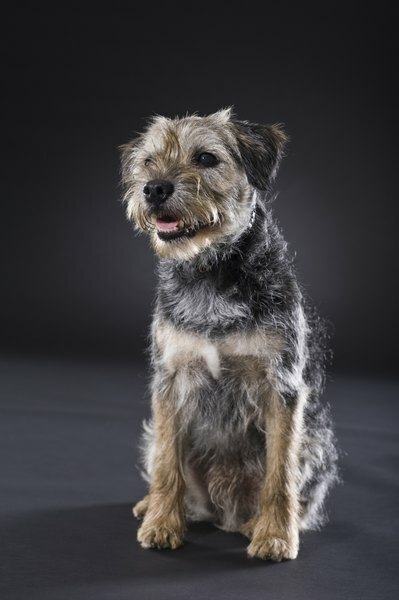 If you get too excited, your dog is likely to start wiggling and dancing around, as border terriers are known to do! Introduce a verbal command after your dog is lured easily into a standing position. As you lure your pup into position, confidently say, "stand." Practice the command 10 to 12 times in a row, always saying the verbal cue as you lure your dog to his feet. Hide the treats behind your back, in your pocket or on a chair placed beside you. Don't pick up a treat, but use the same hand motion you've been using to lure your pup into position. Give the "stand" command confidently as you do so. As soon as your dog is in position, reach down and reward him with one of the out-of-sight treats. By using only your hand without a treat in it, you teach your dog not to be reliant on seeing a food reward before he performs the behavior. Begin practicing the stand position in a variety of places and situations. Always praise your dog for success and provide a reward every few attempts. If your dog stops performing the command, practice in a low-distraction environment for a few days to solidify his understanding. Don't move too quickly while teaching new behaviors. You'll only foster confusion and frustration for you and your dog.